Click above on a title that is online now. Rich editorial material accompanies each text, including detailed historical notes, glossaries, maps, and documentary appendixes, which record the author's revisions as well as unauthorized textual variations. Search individual texts of Mark Twain's works, including annotation and other scholarly resources. Search the texts of Letters 1853–1880 for references to the Writings. Cross-reference existing print volumes by using the “Go to Page” function. 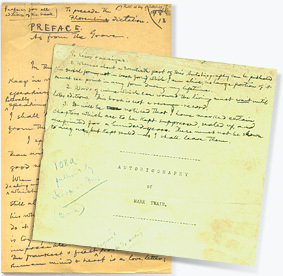 The Mark Twain Project's editions of the writings are established using the earliest relevant sources and the holdings of the Mark Twain Papers collection at The Bancroft Library. The goal is to produce accurate, fully annotated texts that come as close as possible to realizing Mark Twain's intentions. Most of these texts have been digitized from the Mark Twain Project's printed volumes. Although every effort has been made to ensure accurate conversion, errors do persist. MTPO searches out and corrects these errors, and welcomes input from users.